and drink points, prizes for all, and lots of cake at the end! 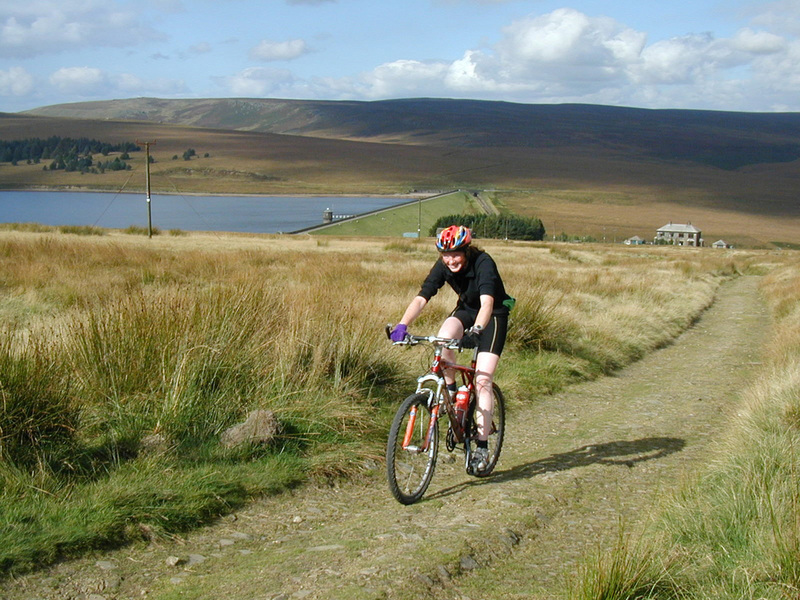 Its generally known that a respectable time to complete the route in one go is around 7 hrs and for this you will need a well maintained mountain bike with a full range of gears. Well how about Jeremy Copland's effort on a single speed bike and a incredible time of 4hrs 18 mins! What about going round the loop not once but twice, at night!! A few years ago a bunch of riders from the area came up with the idea for "The Double Mary" This was done on the summer solstice. There was apperently a stash of refreshing beers burried en route to numb the riders of their pain! Please email me with your interesting feats of endurance and I would also like to know the fastest time recorded to complete the loop by both men and women. The fastest I am aware of is a few mins over 4 hrs. 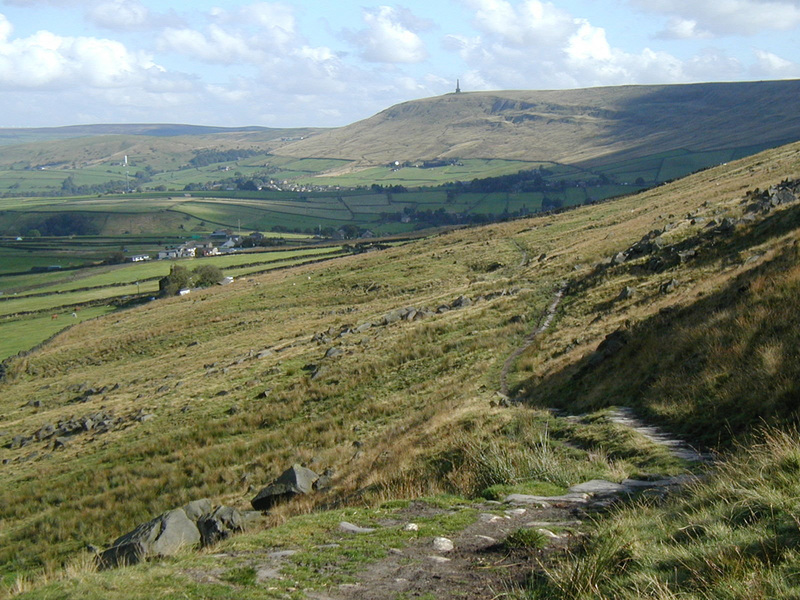 Mountain bike hire in the Rossendale Valley providing access to what we believe are some of the best trails in the country. 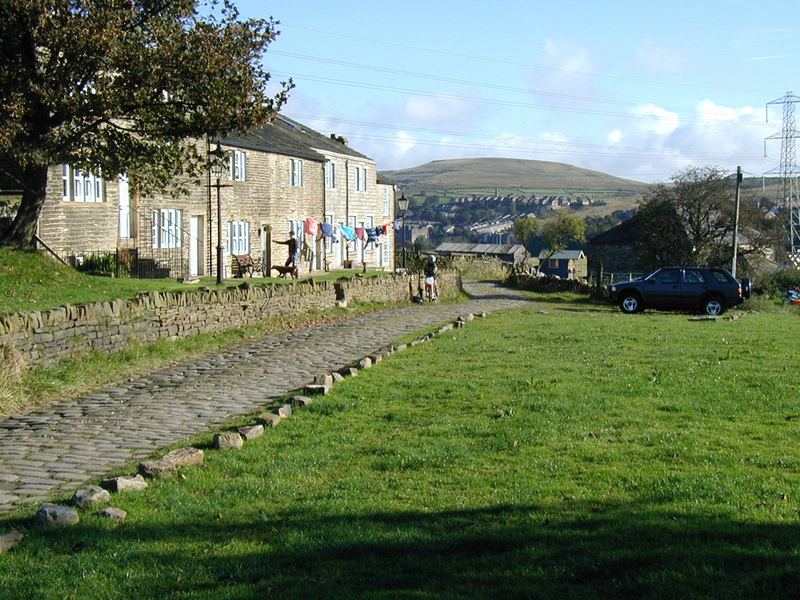 Our high quality bed and breakfast accommodation actually on the Mary Towneley loop route has everything you need to relax and enjoy this great Pennine landscape. Combined with superb facilities, fantastic value food and drink. the ability to ride at least 30 cross country miles is a must. Don't be tempted to ride 2 days prior to the big day, the rest will do you good! Take energy type bars, gel, sandwiches and 3 litres of high glucose type drink. You can get away with less, but it will hurt! 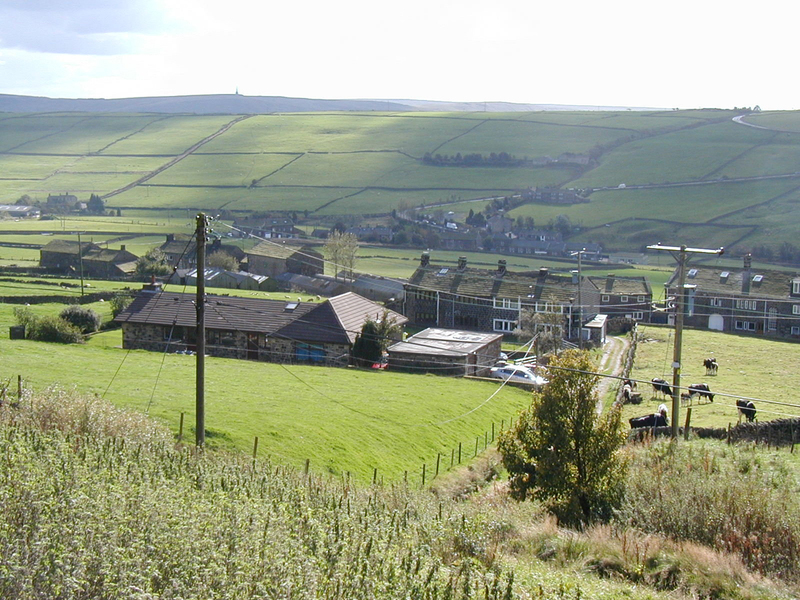 The Ram Inn at Holme Chapel is spot on for a mid ride feast, and so are the New Delight at Jack Bridge above Hebden, the Sheperd's rest and the Topbrink both at Mankinholes. In Waterfoot there are a couple of good Bakers (Mon - Sat only) 100 meters away. Hebden Bridge is actually a mile or so off route, so it takes extra effort to bring your ride length up to the 50 mile mark! It worth it though as I usually go to the Chip shop in the centre! open 12.30. There are other shops if you know where to look. I never fail to stop at the famous Aladdin's Cave, 200 meters the opposite way along Edge lane above Jack Bridge. You will be astounded at what's for sale in that fantastic farm shop. This nugget of info is invaluable. The Spring water that you hear gurgling away while you shove that hot potato pie into your mouth outside the shop runs pure and clean. "Fill yourself to the Gills! " 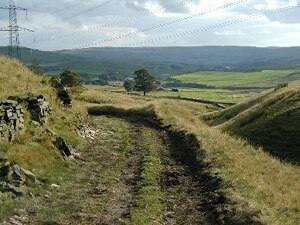 Welcome to The Mary Towneley Loop, a (47 mile) circular route which forms part of the Pennine Bridleway National Trail. 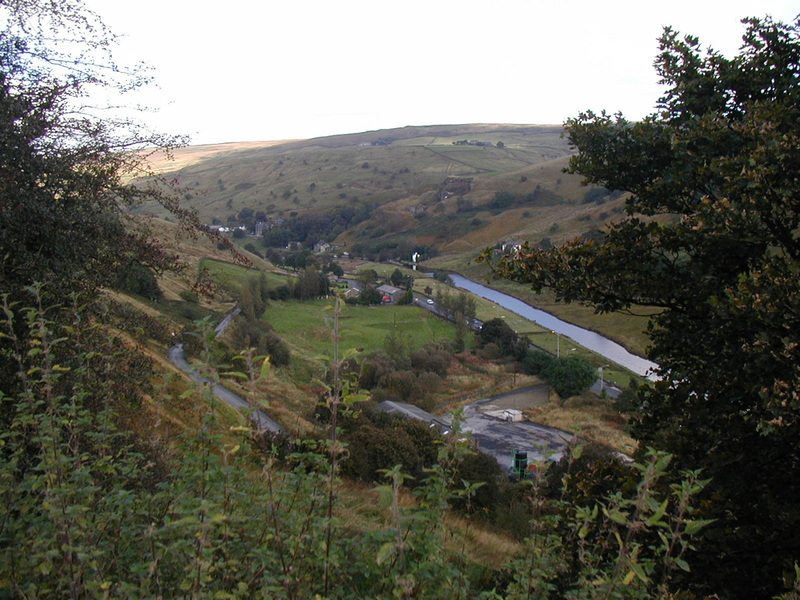 but for this description I started the ride in the Rossendale Valley and the small town of Waterfoot. 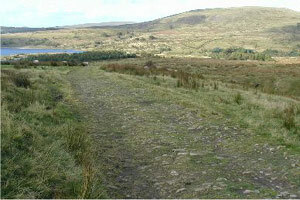 to meet an historic route, the "Grovey" Rooley Moor Road that straddles the hills above Rochdale and Ramsbottom. "It was built with stone sets to provide work during the cotton famine in the 1860's." 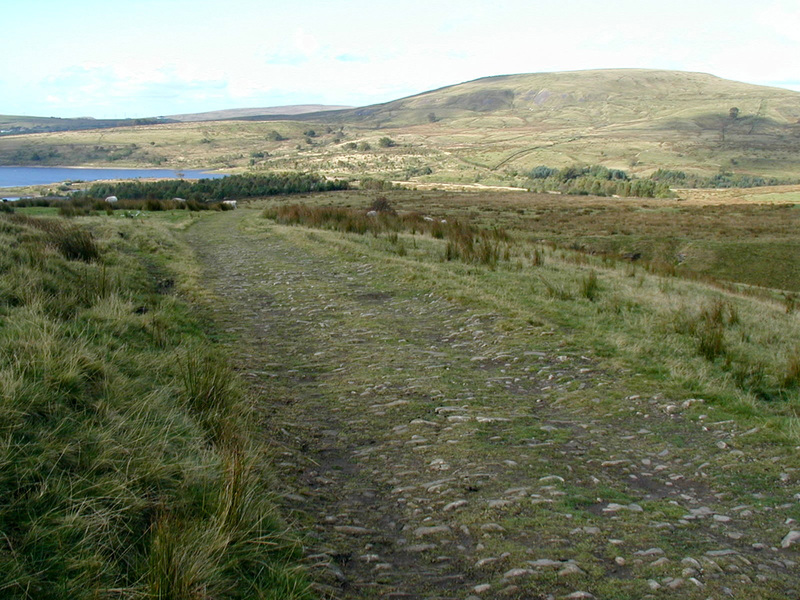 North of Rochdale, the route passes over open moorland close to Brown Wardle and Watergrove Reservoir, then onto Calderbrook. 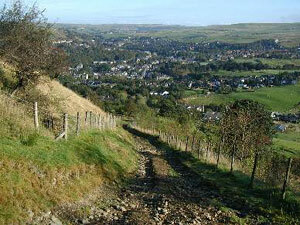 The Trail then follows an old packhorse route from Bottomley to Erringdon with stunning views across the Calder Valley. 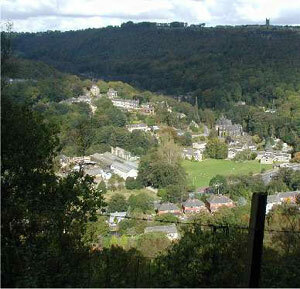 near the historic town of Hebden Bridge. The climb out of The Hebden Gorge is cruel, but has to be done. 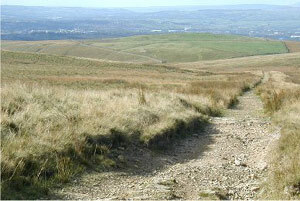 providing splendid views towards Burnley. The best map for the route is O/S Explorer 21. 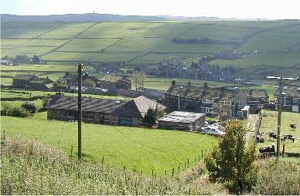 1 I started the ride here..
in Waterfoot. 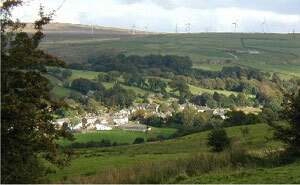 Its a small town hidden in the Rossendale valley. There's accommodation, safe parking, shops and pubs. 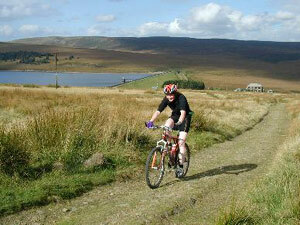 Its also the starting place for the Pennine bridleway mountain bike challenge. Its a great way to get this epic under your belt. 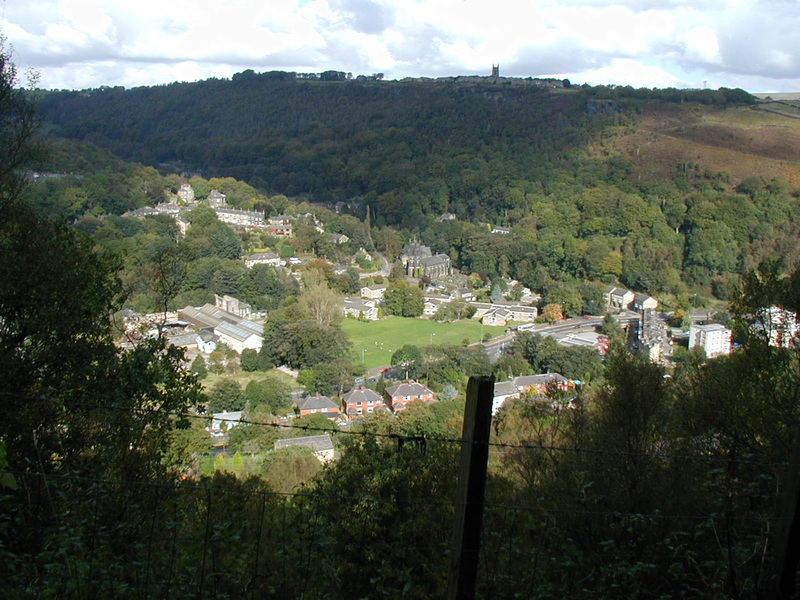 Half of the way round the loop from here is the excellent township of Hebden Bridge, which is full of shops, Pubs and a good Chippy. I rode the loop in an anti clockwise direction for this piece, but have done it many times both ways. I must be the luckiest person alive to have all this and more within riding distance from where I live. This is the difficult bit where its very loose and steep. the gods are smiling and there's a fair wind you will be riding over there in 7 hours time! 3" Did you clean it, I didn't." This is the top of the first climb. 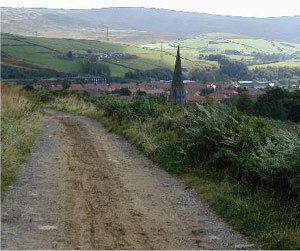 Holcombe Tower in the far distance. Beyond that are the flat plains of Irlam. Turn left and follow that finger post. to the Top of leach. 4 Oh no, the Rooley Moor Rd! Going down it will shake you to bits! Try to ride next to the verge for a bit of relief. you will wish you had not been born! Its cobbles then loose gravel and small round rocks. if your coming up, its goes on forever, or 20 odd mins middle ring 2-3 gear down the block ! "its a love hate thing!" 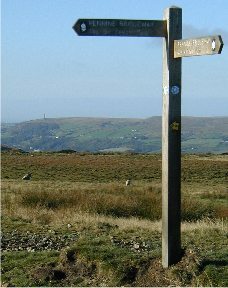 5 Look out for the signpost..
cruise down into broadley fold. Oh Please no more cCobbles! "Never mind 29" wheels, you need 50"
make out Rooley Moor, You remember Rooley Moor Rd don't you? Yes that's right, its were you had your first puncture! The next couple of miles are the brill, and most of it is downhill. What about that for a bit of good riding? 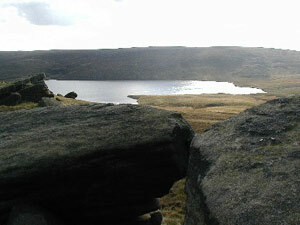 In the far distance is Blackstone Edge. In front of you Calderbrook, and to your right is the famous Pennine Trout fishery. More 10lb plus trout are caught in this fishery then any other water in the country. "turn left at the bottom." 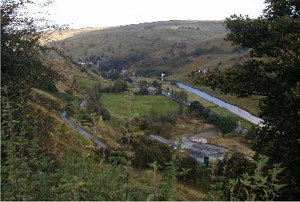 Down below run the main arteries between Todmorden and Littlebourgh. 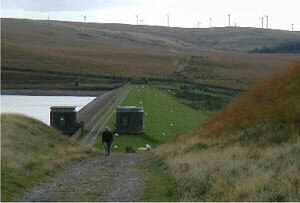 The main rd, The Rochdale Canal, and the Summit Railway Tunnel. 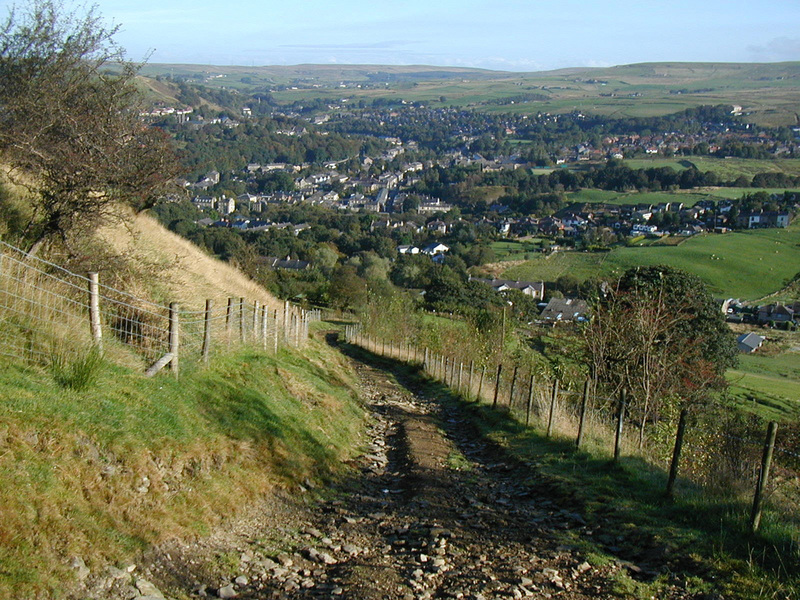 Climb steadily and then you drop almost vertically down the valley to Bottomley. Turn left at the main road then right at the finger post. This takes you over the Canal and then "push" climb steeply on an old Packhorse trial to a farm yard. 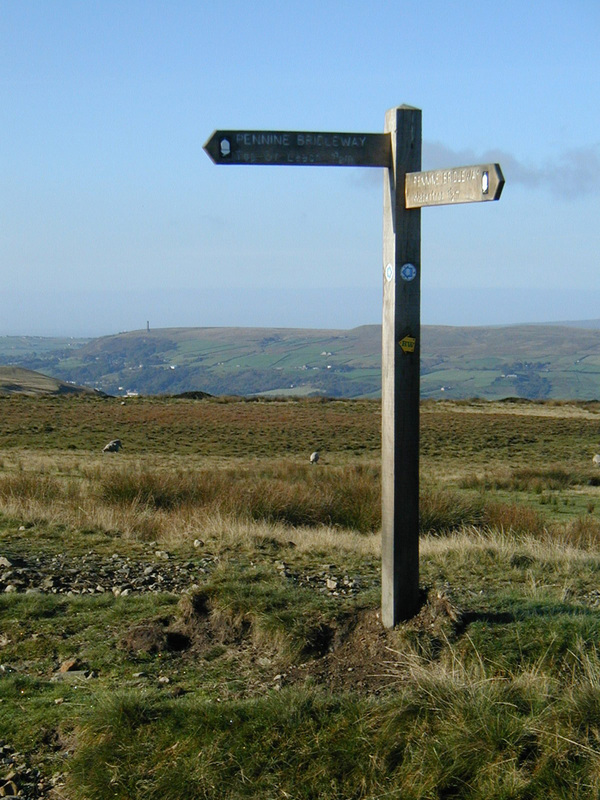 turn left in the yard to continue onto the lovely Walsden Moor. 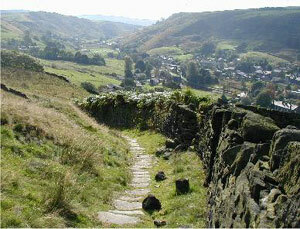 Looking back, Bottomley down below. We have now crossed over to the other side of the valley and onto one of those pack horse trails that this part of the Pennine's are famous. Ah, let your eyes follow the track into mountain bike Heaven. 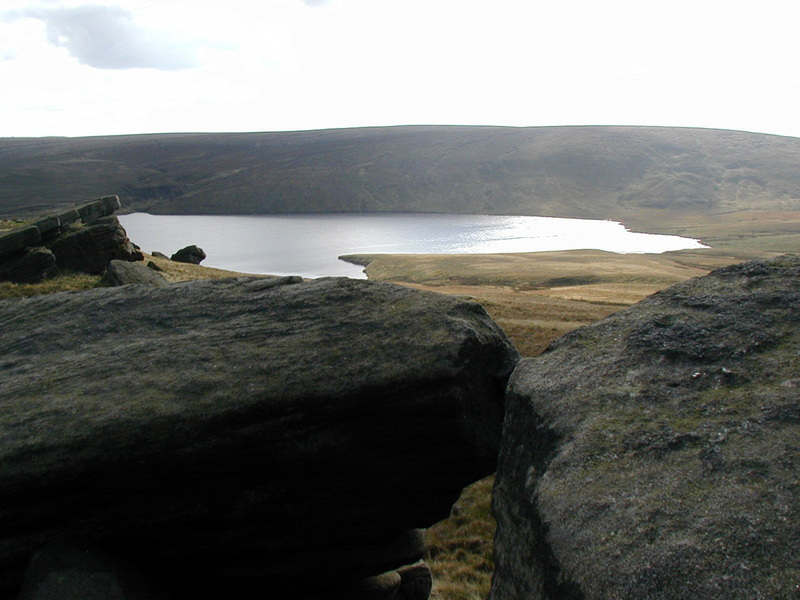 Bounce your way down the stone sets to the road and your first potential pub stop, "The Shepard's Rest". After this there's a quick tarmac downhill, look out for the sudden left turn at the bottom and up some steep cobbles. "OMG hit the granny ring!" "Behold" your second chance for some grub, The Top Brink. Then its up on to that wall line you can see below the monument. Its a great section, slowly climbing until you are well behind the monument. Enjoy your well deserved plummet on the long descent to the valley floor. You are unlikely to stop during your magical decent, so I have taken the time and trouble to stop take the camera out of my rucksack and show you what you missed! Callis Wood to my left, Hebden Bridge to the right, and Heptonstall up above. when you get to the bottom, go across the pegasus crossing, turn left then first right and continue with the second half of your epic. You may however wish to turn right and make a detour to Hebden Bridge. is about a mile off route. So it takes a little extra effort to bring your ride length up to the 50 mile mark. Its a perfect stopping over place. Loads of shops, ducks, trout and pigeon's. Time to take stock of the situation and give your body a rest. Maybe refuel in one of its Cafe's, Pub's or my fav Chippy. 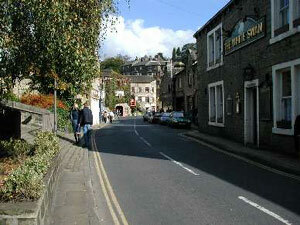 Its a cruel climb push out from Hebden. If you can ride it without a dab you must be a climbing god, or goddess for that matter! Write your name on the wall at the top if you do! After gaining all that height you now drop down to the New Delight pub. 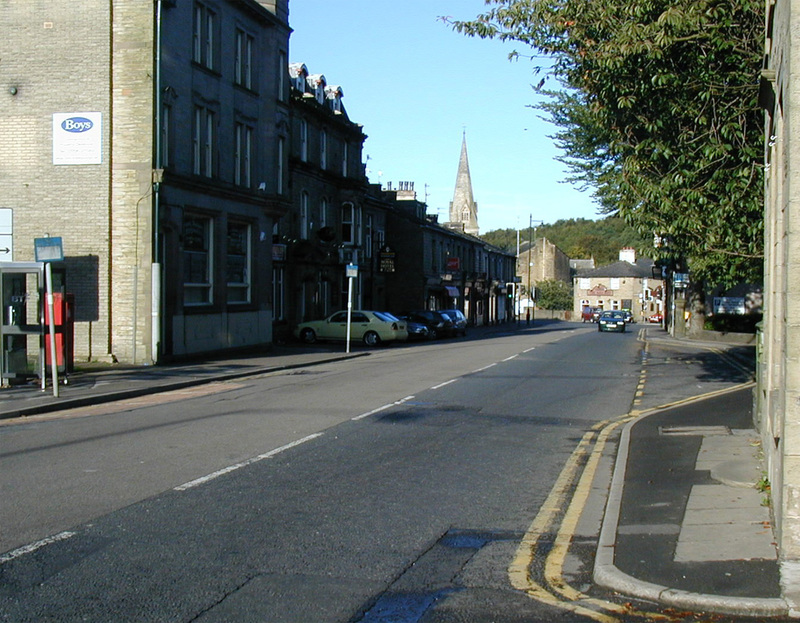 This picture was taken on Edge lane, looking back down towards Jack Bridge and the New Delight pub. 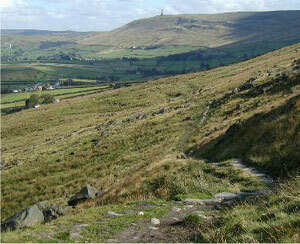 Stoodley Pike is way in the distance. "the famous Aladdin's cave shop only a few meters away to the left from where I took this pic"
Edge Lane finally turns into bridleway, it tops out over the crest of the moor at Reaps Coppy. This fellow lady mtb,er is also enjoying the wonderful tracks of the area, but unfortunately is going the wrong way. I just held open the gate and let this beauty slip away! Enjoy the fast downhill to the house nr the res. 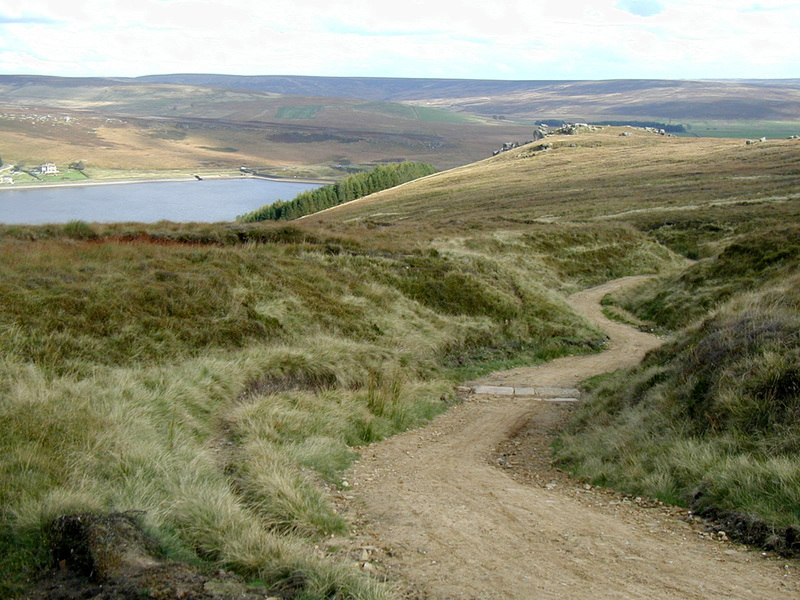 The final section of the Widdop Climb, "If you can get around this bend you've nailed it" I love this climb, it starts way down there on the Dam wall of Widdop Res. Its quite an achievement to clean, as the track is almost back to what it was a few years ago. Lots of fist size rocks to have you scrambling for traction. 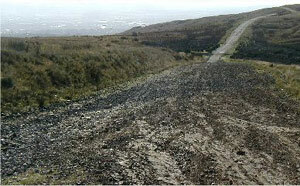 This picture was taken just after the track was laid. This is the Yorkshire/Lancashire boundary. At the summit of the Gorple gate track. "your gonna enjoy this next bit"
17 "Now for one of the best downhill's in the area." Give this one your best shot, Its loose in places so, "watch out for the fist-sized rocks". Most of it is eyeballs out and manageable. Enjoy jumping those water barriers. Its a lot smoother now since the Motor bikes have stopped cutting it up. If you can stay puncture free and when your velocity finally drops on the banks of Hurstwood res you will know what I mean. Burnley is way down below in the distance. 18 Are you still in one piece? This is Cant Clough Res. 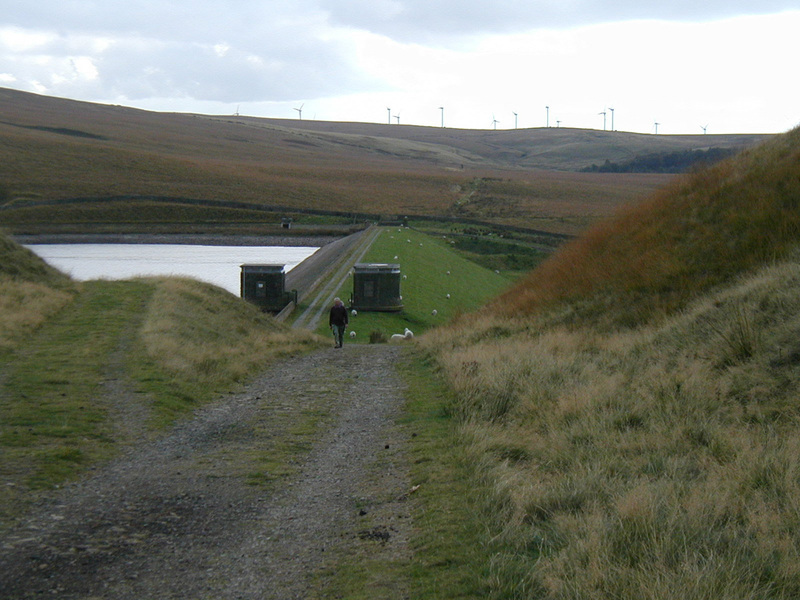 Its just a little climb over the hill from Hurstwood Res. 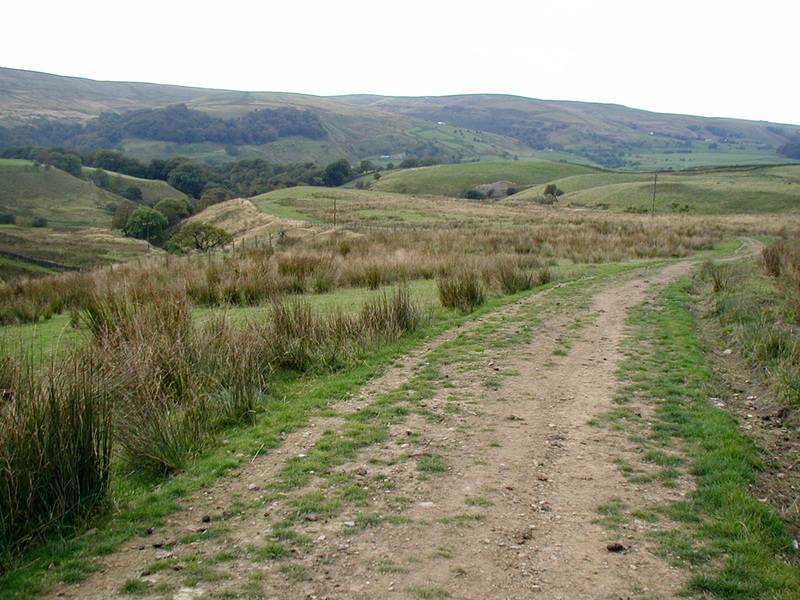 Another nice piece of track takes you near to Coal Clough wind farm in the distance. Turn right when you get to the main road, look for gate on opposite side to continue. 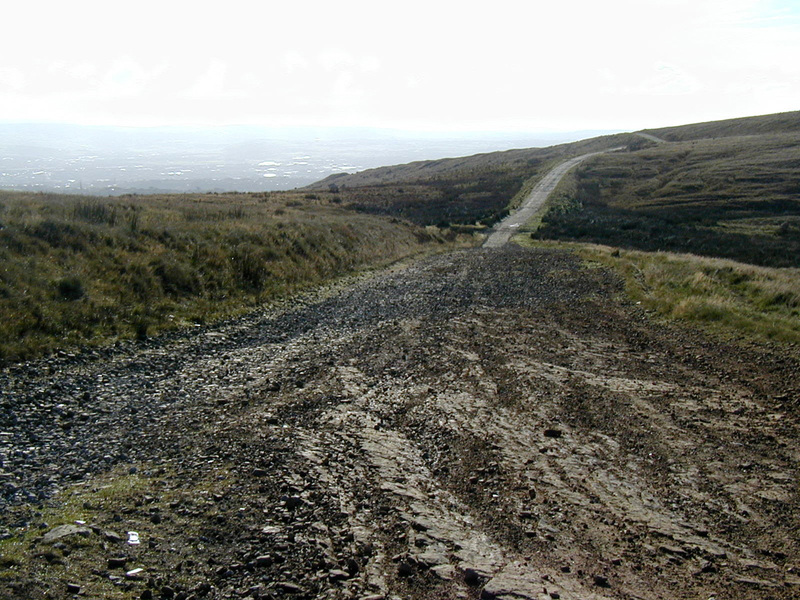 A fast downhill with a small climb in it. 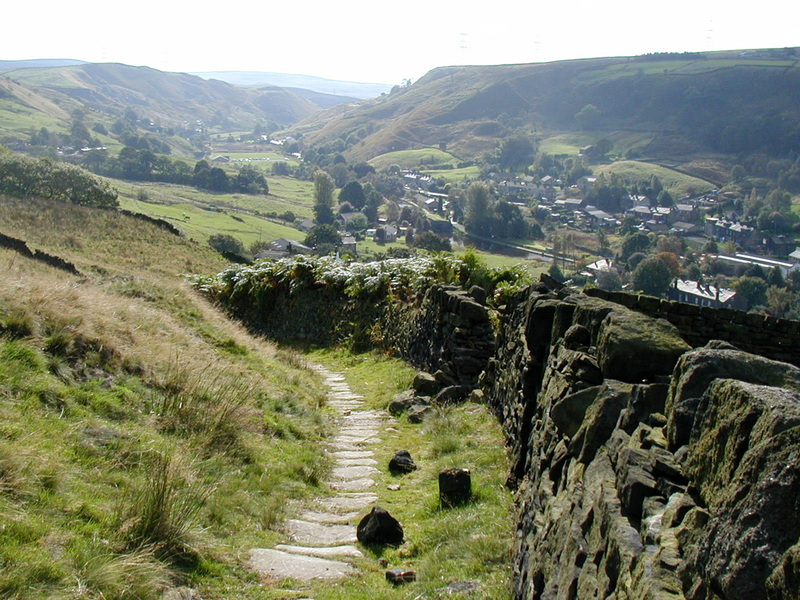 This takes you down into the Cliviger Gorge and Holme Chapel. Here you will find the last pub of the epic. The Ram Inn. 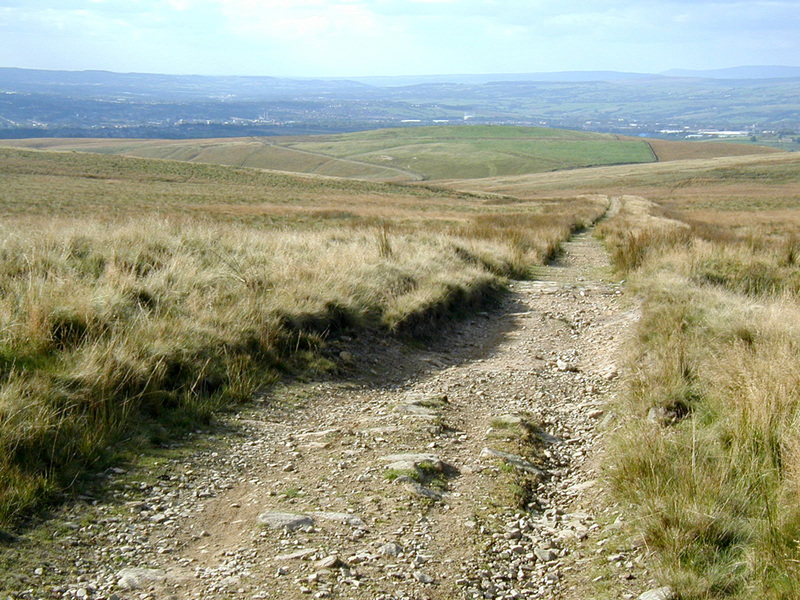 One more big climb to go now, and that's Deerplay Moor. "There it is in the distance"
20 "Looking back half way up the climb"
After crossing the main Rd at the Ram Inn, its left down a track and under the railway. 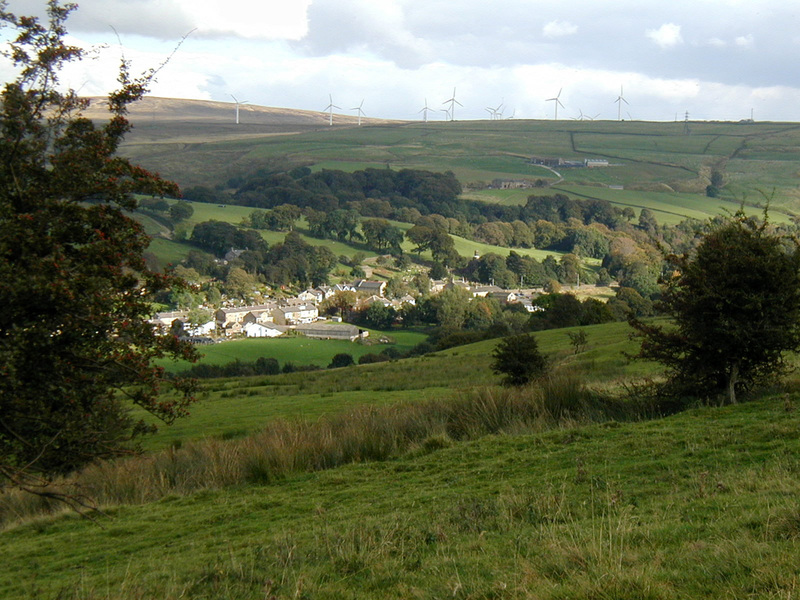 As you look back you can see Coal Clough wind farm and Holme Chapel down below. This is one of the few un surfaced bits. Its a grassy push unless your legs are like Iron! If you can make it through the two hairpins onto the grassy field you have a good chance of cleaning this one. Zig zag up the grassy climb to make the grade. 21 At the top ..
of the grassy climb you will come across this monument. When I arrived here, the late afternoon sunshine picked out the inscription to its best effect. Take some time out here to reflect. 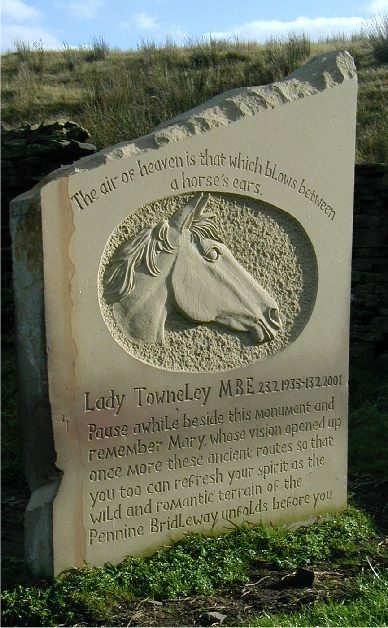 Thank you Mary, Lady Towneley. "Make's you feel kinda good." 22 And finally here we go..
30 minutes from the end. The last leg of the epic. 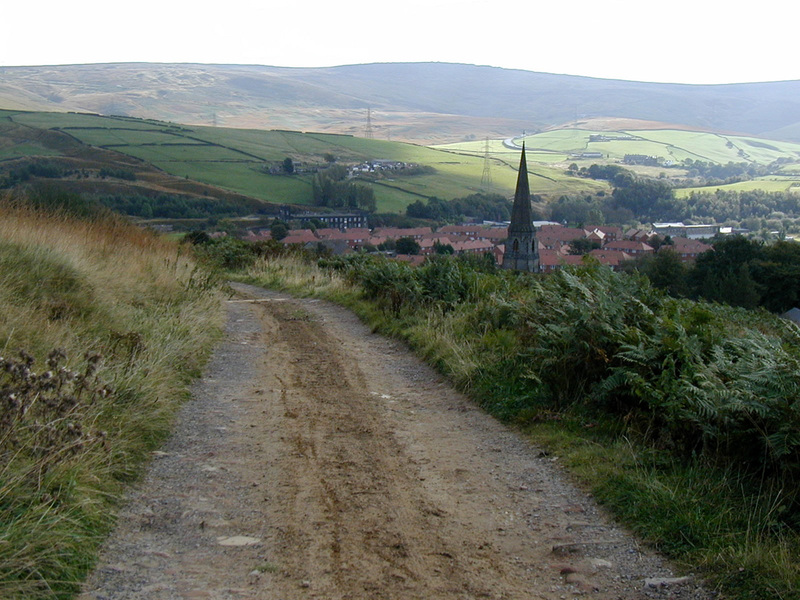 The undulating descent back to Waterfoot. There's lot of gates, but not as many as there used to be. In the far distance is Cowpe Lowe again. I have to admit that this ride is an absolute classic, and is a must for any serious mountain biker. 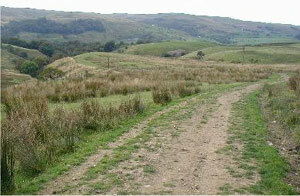 and numerous other private landowners who have dedicated new bridleway links. Many thanks to the staff at The Countryside Agency for their help with the map.